We know the Galaxy S is getting the official 2.3 version of Android (Gingerbread) some time this month. 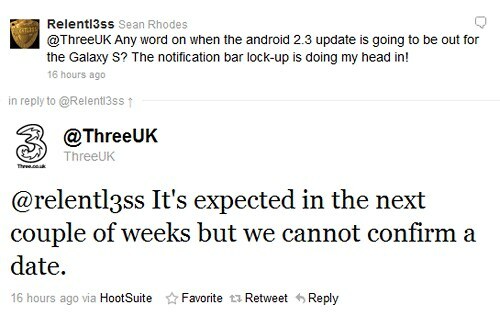 But the UK operator Three has confirmed the update for its customers is coming in the next two weeks. That's great news for Galaxy S owners, which use that particular operator. As for the rest of the world, the update should come sometime this month. We also found this official press-release that states the all Galaxy S users are getting the update in mid-April as well. The Samsung Galaxy S has been around for a long time now. And it seems that it's getting the respect it deserves - with the much needed Gingerbread 2.3 update. It's very important for the big manufacturers to show this kind of support for their older devices.